Description: This elegant shade plant has gently arching stems and dangling creamy bells. 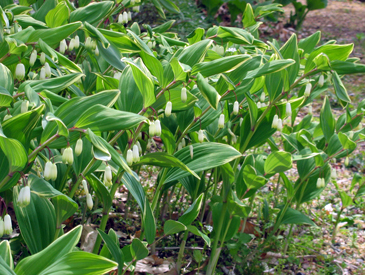 Solomon's seal adds height and grace to shaded gardens in spring. It's an easy plant to grow, and will slowly colonize -- even in tough areas where shallow tree roots rob moisture and nutrients. The foliage turns golden in fall. Tips: Propagate from seeds or dividing.